The Central Bank of Sri Lanka has officially declared that the prevailing inflation rate in the country is 26.6% which is slightly below the previous declaration of 28.2% just a few weeks back. Despite the fact that there are diverse opinions with regard to the actual rate of inflation in the country, it has to be accepted that Sri Lanka is among the very few countries experiencing an abnormally high inflation rate in South East Asia at present. Although there had been an unprecedented increase in the prices of oil and increased consumption levels attributed to mass markets such as India and China with a resultant escalation of food prices leading to inflationary tendencies throughout the world, Sri Lanka’s position as being one of the highest in terms of inflationary rates in South Asia needs serious attention of all citizens since further escalation of such a situation will be really detrimental to everybody. Rapid increases of prices of essential items in a very short timeframe without any control can lead to a situation called ‘hyper inflation’ and when we look at the history of several countries including Russia, Germany, Israel, Bolivia and Turkey it shows that these countries too have gone through a period of “Hyper inflation’ in the past and currently Zimbabwe is a country facing such a serious inflationary situation in the world. The term ‘Inflation’ simply means the rapid increases in prices of goods and services of a country within a short period. A rapid increase in the rate of inflation is definitely a serious problem of any country since the value of hard currency erodes rapidly discouraging savings and encouraging borrowings which further contributes to high inflation. It also affects the balance of payments of a country widening the trade gap with exports discouraged paving way for more imports as importing becomes cheaper than domestic purchases and also exporting. Furthermore when there is a rapid increase in inflation people would not go for long-term well planned investments but will concentrate only on day- to-day living which in itself in highly detrimental for the long-term growth of an economy. Bank interest rates have a very close relationship with the inflationary rates of a country and very often interest rates act as indicators of the inflationary rate. Quite apart from the constant attempts made by Central Banks to curtail inflation using the interest rate adjustment mechanism as a monetary policy to curb inflation, the average depositor too decides on his investment options based on the inflationary trends and the interest rates offered by Banks. When the inflation is high the prices of commodities increases and the purchasing power of ‘hard currency’ declines rapidly thus forcing people to invest their money in seemingly speculative ‘high yielding’ investments on a long-term basis without a proper planning on return on investment rather than investing in average Bank savings accounts. Basically when there is a tendency for high inflation people opt to go for borrowing for day-to-day consumption and those who have surplus savings will go for long-term investments such as in gold and land etc. without any preplanned returns depriving the much needed cash inflow to the Banking system and the required liquidity levels in the Money market. Since the Banking system of a country acts as a human body’s blood circulation system in mobilising financial resources for needy sections of the country/ economy, slow down in Bank savings means a definite slow down in the economy due to lack of adequate funding for development activities thus resulting in long-term adverse consequences. When one looks at the changes taking place in the Bank interest rates in the recent past almost all commercial banks in the country have increased their rates of interest on average one year fixed deposits up to around 18-19% p a which is about a 2-3% increase compared to the rates offered just six months back. Correspondingly the average lending rates of the commercial banks too have been increased to about 25-26% p a which is an upward revision of about 5-6% from the rates applied a few months back. Whilst the average savings interest rate offered by the commercial banks remains static around 4-5%p.a with various incentives being offered such as lottery schemes with valuable prizes etc. to attract and retain such depositors, some of the commercial banks in the recent past in an unprecedented move have commenced introducing ‘special savings accounts’ under various brand names offering high interest rates ranging between 12 to 14%p.a. in order to retain the existing deposits as well as to attract specific market segments whilst being competitive in the market. There are numerous other non-banking financial institutions too operating with or without licences from the Central Bank of Sri Lanka which offer exceptionally high interest rates in order to attract depositors who are desperately looking for a ‘better return’ on their hard earned money in the face of the high inflationary situation prevailing in the country at present. According to the official figures declared by the Central Bank of Sri Lanka the rate of inflation which stood at 16.4% in December 2007 has increased up to 28.2% (71% increase) during June 2008 which could be considered as an unprecedented increase that has taken place in the recent past. As we have witnessed in the past few months this high inflationary trend has led to a higher rate of interest on bank deposits which in turn has effected an upward shift in ‘lending rates’ of commercial banks. This is due to the fact that banks are trying to maintain an appropriate ‘mark up’ to cover their operational costs, risk premiums and profit margins etc. 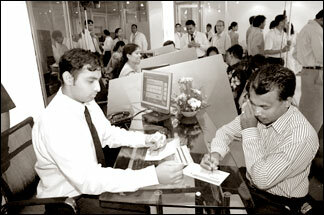 In addition to the interest rate offered to the depositors when deciding on the interest rates on lending. The final outcome in a highly inflationary scenario would be the exceptionally high interest rates that will be applied on bank lending and ultimately the average borrower will have to bear the burden in terms of an unbearable interest cost. The burden on the average borrower is quite evident from the high incidence of delays in repayment of bank borrowing experienced in the recent past with almost all the commercial banks in the country pressed for tedious money recovery action to recover their dues. This scenario applies to other non-banking financial institutions as well. The Central Bank of Sri Lanka recently issued new guidelines with regard to classification of overdue loans in a move to closely monitor loans of Licenced commercial banks. According to these new guidelines the commercial banks are required to classify credit facilities as ‘overdue’ when the due date of payment of the monthly instalment of a loan exceeds by 61 days as against the previous limit of 91 days. This new regulation despite the good intentions behind has made a severe impact on the ‘Non Performing Advances’ (NPA’s) of commercial banks requiring very close monitoring of credit facilities and expeditious recovery action. Due to this latest method of classification of NPA’s the overdue loan portfolios of most of the Commercial Banks have increased by several billions in some cases severely affecting their financial performance since Commercial Banks are required to set side appropriate portions of their profits as provision for bad and doubtful debts. Due to such strict guidelines prudent bankers become more stringent in their lending decisions, credit approvals and granting new loans which may result in an indirect ceiling on Bank lending although there may not be a very visible impact of this on the short run. Both the increases in the lending rates as well as any curtailment of granting of loans by the commercial Banks on the pretext of more stringent pre lending analysis would finally affect the ultimate borrower which in turn will have a direct impact on the economy in terms of lowering of production and employment generation. When Bank borrowing becomes too costly entrepreneurs will naturally be discouraged from borrowing for investment purposes in new projects/ ventures etc. which will directly have an adverse impact on the overall economy on the long term. Since inflation is a result of more money in circulation than the goods and services available for consumption, one of the important measures in curbing inflation would be to increase production of goods and services in a country whilst curtailment of which would further aggravate the situation. Hence increasing of interest rates only as a means of curtailing money supply in an economy can lead to many other negative side effects in the long run including lowering of production in a country unless effected in a well balanced manner. One of the main sectors which have been severely affected by the recent increased lending rates is the ‘personal borrower’ who is the monthly wage earner wanting to obtain a housing loan or a personal loan to repair his vehicle. Although the monthly commitment of the repayment on such credit facilities keep on increasing along with the increases in the interest rates coupled with the increases in the personal expenses for day to day living due to the high inflationary trend, the repayment of such personal loans become an acute problem since the average wages have not been increased to meet such an upward movement in interest rates and cost of living. This situation has resulted in most of the personal borrowers of commercial Banks facing real difficulties in meeting their financial obligations in time leading even to legal prosecution by Banks. The use of ‘credit cards’ in Sri Lanka increased tremendously during the past decade due to the active promotional campaigns carried out by most of the commercial banks in the country with certain foreign banks taking the lead. However the present inflationary trends have tempted most of the credit card users for increased borrowing as a means of instant and an easy provider of ‘purchasing power’ and finally ending up being unable to repay such borrowing with huge interest burdens since rates applied are comparatively higher than normal bank borrowing. The recent Central Bank guidelines on provisioning for Non performing Loans has introduced stringent provisioning requirements on credit card outstnadings as well, making it mandatory to categorise as ‘Sub Standard’ when the ‘minimum payment’ of a credit card outstanding is delayed by 120 days as against the previous time frame of 180 days. When such borrowers due to genuine reasons are unable to repay their debts are compelled to repay their overdue borrowing by the Banks the only option available to most of them would be to hurriedly dispose of an immovable/movable property belonging to them to supplement the funds required to repay their loans and disposing off of such properties in a short time frame at reasonable prices has become a real problem specially in a depressed economic situation similar to the one we are experiencing at present. Although Licensed Commercial Banks under money recovery action are legally authorised to auction and/ or acquire mortgaged properties to recover the overdue debts under ‘Parate Action’ (Recovery of Loans by Banks special provision-Act No: 04 of 1990) they too find it difficult to find suitable buyers who are readily willing to purchase such acquired properties in a highly inflationary economic satiation of this nature thus Banks end up becoming owners of many prime properties without realising the much needed liquidity. This situation once again affects Bank’s lending channels since the money lent (bank’s assets) are locked up in unproductive illiquid assets such as immovable property/vehicles etc. for indefinite periods of time without bringing in any productive cash inflows to the banks or the banking system. Unless this rapid inflationary trend is arrested in the near future despite the fact that the interest rates offered by Commercial Banks to their depositors could be further increased to suit the inflation trend there is a definite limit up to which the ‘lending rates’ could be increased since after a certain point there will be no borrowers for borrowing at such exorbitant interest rates. Hence if the average borrower stops borrowing on the face of unbearable interest costs eventually the banking industry will be the first casualty and thereafter the whole economy since it will create a chain reaction on almost all sectors of the economy in vicious cycle. In a situation of this nature Commercial Banks will have to act in a very responsible and prudent manner in continuing with selective lending as much as possible whilst maintaining ‘reasonable profit margins’ without over burdening the borrowers. Narrowing down of interest spreads, reducing non preforming loans and curtailing operational costs whilst maintaining reasonable profit margins etc will have to be the key strategies that Commercial Banks will have to strive at present. Furthermore borrowers who are faced with genuine cash flow problems will have to be assisted by way of rescheduling their repayment programmes providing longer repayment periods with appropriate interest rate reductions etc. in order to create a win-win situation looking at a more long term strategy of survival. Whilst the partial opening up of the Treasury Bill market recently for foreign investors is a positive move towards easing out the current liquidity problems in the economy at least as a temporary measure from a fiscal point of view, the Government as well as the Central Bank of Sri Lanka will have to play a major role in trying to curtail high inflationary trends in the country with fundamentally sound economic/ monetary policies with encouragement for improved production of goods and services in the country with suitable Foreign Direct Investments and making our local rupee stronger as against foreign currencies rather than trying to artificially control the inflation solely by manipulating the interest rates in order to have a proper balance of such economic forces to prevent any major economic calamity.